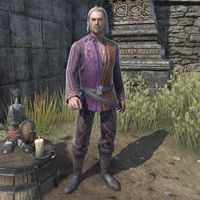 Sheogorath is the Daedric Prince of Madness and ruler and creator of the Shivering Isles, with a particular affinity for anything cheese-related. He is the antagonist of the Mages Guild questline. Shalidor seeks to take back the island of Eyevea, which he lost to Sheogorath in the First Era, to act as a sanctuary for the Guild. Sheogorath : "You heard me! Sheogorath : "I've always wanted to meet a person within a person! Tell me, what's it like? Mayor Aulus : "I'm … I'm so sorry, Sheogorath! I thought you'd abandoned me! Sheogorath : "Aulie, I left you a tongue that drives people mad! But I suppose if you don't want my gift, I can take it from your mouth and give it to my new favorite mortal friend. Mayor Aulus : "No! Think of all I've built here, the wonderful screams I've created, all in your name. Doesn't that make me your favorite? Sheogorath : "Oh, very well. Sorry, my second favorite mortal friend! We had a good run, but it's time for your curtain call." Sheogorath : "Such despair! Richer than a cheese sorbet!" "I see you've reacquainted yourself with Daraneth. Unacquainted? Unrequited! There there … she'll come around to you. Like I did!" "Well, if it isn't my old friend Hunt-For-Books!" "Now don't look so glum, or the Skeevers'll notice. Then they hit you up for spare gold, a few shin bones, your best pair of cheese-filled slippers. Insufferable beasts! They can't hold a conversation." Either way, you can ask: What do you want? "Mayor Aulus is a curd in the soup. A real fly in the whey, don't you say? Made a mess of the gift, the kind from the wrong end of a dog. I tried to encourage him. Even brought him a hero to destroy! But he couldn't go through with it. Can you imagine?" "I led you right here to make it all boring again. And what did he do to stop you? Nothing! There I stood in my best old-lady suit, and he said it was all my fault! Ah, he just needs motivation. What better than an escaped prisoner seeking vengeance?" "Could you kill someone you love? I can't~ Well, I have. But not Mayor Aulus, it would be too pedestrian. No, I want you to try killing him." Why should I try to kill him? "I want him to reach deep down, below all the marmalade and crushing failures defining his life, to find a seed of confidence, and grow it into a tree of gumption he'll use to beat your brains to paste. But if not, any brain paste'll do. Even his." I'll do this if you swear to leave Southpoint forever. "Deal! Oh, and one more thing. Daraneth stays behind. If you bore me too much, I'll turn her into a goose, roast her, and feed her to you covered in find Eidar glaze. The goose, I mean. It's a might bit chilly for my Eidar-pants." Sheogorath : "And make it entertaining, would you? After spending so much time in this town, I finally know where the Colovians keep their fur hats." Sheogorath : "Already bored! Here, I brought you some presents. The shiny ones are always the best, wouldn't you say?" Sheogorath : "Haste and blood! It's why you're my new favorite mortal. Well, also your buoyancy. But mostly haste and blood!" Sheogorath : "Bridge is out! My boredom washed it away. Really got in the cracks, there!" "Oh, you can't seem to catch a break, can you? Chin up, just like the bridge! Adversity is the brother-in-law of propensity! As they say. " "Eh, a proper hero needs obstacle. Struggle. Repeated attempts at bodily harm. You're going to play the proper hero to Aulie can shine! Or our deal is off. And if it's off, so is Daraneth's head. To Skyrim! In a field! With berries growing from her eyes. " Sheogorath : "Do you have to lumber about like that? Show some …. Show some panache! A little swagger!" Sheogorath : "This just isn't your day. But your Uncle Sheogorath can make it better!" "I can never decide between Choice and Free Will. Which will triumph in the end? But why not settle the matter for me. Or you could yank a lever, but that's hardly fun for either of us." You asked me to kill the mayor. Why are you playing these games? "I just told you! Choice and Free Will are subjects I hold quite dear! So, you could fight a very good friend of mine. Or you could pull another lever. You're Choice!" "Wonderful! Just say the word and I'll bring him here." Sheogorath : "Free Will! Get out here, there's someone I want you to meet!" I'd rather pull another lever. "Oh, all right, but do it with gusto!" Sheogorath : "Remember, with gusto! A big steaming pile of it!" Sheogorath : "Not much gusto. But a smidge of verve, three jots brio … the essentials for a moxie fondue! Mmm, fondue. Hmm? What was I saying?" Mayor Aulus : "What do you mean, coming to kill me?" Sheogorath : "It's a gift! A chance to shine, to prove you have some backbone that won't snap at the lightest touch! Really, Aulie, I'm quite fond of you. Mmm. Fondue. What was I saying?" Mayor Aulus : "That you're fond of me. That you don't want to watch me die!" Sheogorath : "Watch you die horribly, all alone, and laughing my head off when it happens? That doesn't sound like me. Does it? But I'm sure you can work the matter out for yourself." Mayor Aulus : "Please, don't do this! Maybe we can work something out?" Sheogorath : "Oh, that was exciting! And depressing. Poor Aulie, never finish what he started. you really are a joy to watch!" "And that's why you're my new favorite mortal. When you kill something wonderful, you keep it interesting. Makes me wonder if I should stick around, see what wonderful things you'll kill next." "Think I don't remember, you daft little sprig? Call me a debt-hedger, will you? A deal-fondler? Ah, but you're forgiven. I've always said grudges are like a good cheese. Hold them inside for too long, and you're the one to suffer." Mayor Aulus : "Sheogorath, I've been thinking. Southpoint can't truly appreciate your gift. But if you brought me to the Shivering Isles, I'd fit right in! Sheogorath : "You want to go where you're like all the others? Where you can be a shank of bacon in a house built of bacon shanks? Mayor Aulus : "No! I mean, think of how I could use your gift in a place that truly understood me. Sheogorath : "Well, I suppose you'd make a fine addition to the garden. Very well! The killing's off. Couldn't bring you to my home with more holes in you than when we first met. Just not proper. Mayor Aulus : "Thank you, Sheogorath! Thank you so much. I can't wait to see my new home. Sheogorath : "I'll send you ahead. I need a moment to speak with my second favorite mortal. Don't mind the grummites! They always smell that way." "Choice wins again. Really tugs at the heart-strings! Careful with those. Yank too hard, and the blood goes everywhere but up. I really do admire this town. Shame I can't take it with me. Oh, but can't I? I know just where to put it!" Well, I suppose you're right. Aulie and I could always visit. Perhaps during hurricane season! That would be delightful." Once you complete the quest, he'll glow with a teleportation spell, and holler: "Don't be a stranger! ", then vanishing until your next encounter. Sheogorath: "Look, pup, someone to play with you!" Sheogorath: "Puppy doesn't like you, does he?" "Puppy-killer! Come to steal me books? Wha ...? Who? Where? What? When? Sometimes why! Speak up! Honesty is the best policy, as far as you know." I'm here to recover four tomes for Shalidor. "Shalidor! That pompous Nord and I go way back! I know what he wants, indeed I do. His island. He wants to steal it back. Oh, how I love a challenge." Right. I'll just take them with me, then. "Where's the sport in that? Tell you what. I'll give you one book in exchange for your heart or lungs. Your choice. No, wait. I have a better idea! Let's have a contest. A contest, wrapped in a mystery, with an enigma glaze! Oh, what fun we'll have!" "A few tasks, the odd deathtrap. Nothing so difficulty, as, say, reassembling the Staff of Chaos or rebuilding the Numidium. Take the first book. Puppy-killer. And I'll give you an additional book for each test you pass. Are you game?" I suppose... it's a deal. "Excellent! Cheese and cabbage for everyone! But wait! We should inform Shally-dorable of our deal. With any luck, he'll die of embarassment [sic] all over again!" Sheogorath: "I can't wait to see the look on his face! If it's precious enough, I might hang it on the wall." Arch-Mage Shalidor: "What's the meaning of this? Sheogorath!" Sheogorath: "You remembered! Ah, Shalidor. You never write. You never visit." Sheogorath: "Just now, I made a deal with your lackey here. How long have you wanted those books? Eternity?" Arch-Mage Shalidor: "Your "deals" are hardly fair. What farce have you contrived this time?" Sheogorath: "Think of it as an adventure! And don't worry. I've got a surprise for you too." Sheogorath: "I put a tiny curse on these books. Just a small one! Long story short, Shal: You can never read these books." Arch-Mage Shalidor: "Curse you, Mad God!" Sheogorath: "Boring! Be more imaginative, Shal. Like, "Curse you, Mad God! May you become cheese eternally gnawed by skeevers!" Unfortunately, I have no more time for constructive criticism. Do stay in touch!" "Welcome, welcome, to the Circus of Cheerful Slaughter! Step right up, my mortal friend. The show is about to begin, and you're the star!" "You're going to perform a play. My play, actually. Wrote it meself. I call it "The Folly of Isolation." It's a tragedy and a comedy, both at once. A tromedy!" "You want the next tome, right? Well, I need entertainment! I can only light Prince Maleel here on fire so many times before it gets boring. "Before we get to your motivation, we need to set the scene! The scene: Tamriel. The three alliances are at war, and the wee little Mages Guild wants none of it. They want to stand alone." The play is about the alliances? "Jolly good! You're paying attention. Now, this is a play in three acts. In each act you'll isolate the guild from those bloodthirsty, political, warmongering sons of silkworms. By killing them." "Oh, everyone! Right up to the high muckity-mucks themselves. Just remember: you wait for your cues. You kill nobody unless it's in the script. Now, let's get going! I can't wait to see it performed. Here, Maleel will even light the way for you." Sheogorath will then set Maleel on fire, sending him stumbling yelling "My soul's on fire!" before Sheogorath calls out "Don't forget to light the brazier! Ah, ya daft fool." He will then say "Hah! Guess it still hasn't gotten old. I'll meet you up ahead, at the bustling Pact town of Heartholdhelm!" True to his word, he'll be waiting at the gates to Heartholdhelm. A town full of Pact soldiers of varying races sharing mead and laughter. "Shall we raise the curtain? Begin the first act?" "Our opening act features the Ebonheart Pact. Hah, that rhymes, doesn't it? I'm a poet, and until now I didn't realize it." I'm supposed to fight the whole alliance? "Don't be presumptuous, mortal, or I'll banish you to the Isle of Lusty Bards. Ahem. Like I was saying: as the curtain rises, our Ebonheart friends are at peace. Allies. Historically, though, they've been at each others' throats." If they're at peace, what do I do? "Slavery, border raids, and in-fighting have them primed for chaos. They just need a little... push. I've written meself a part, a small but pivotal role. If you'll excuse me..."
Sheogorath: "Hey! You hate each other! Remember?" Pact Soldier: "Oh yeah! Get em'!" Sheogorath: "Go, join the fracas! This is your cue. Action!" The Pact Soldiers will begin to fight with each other, but it is up to you to ensure none of them remain alive. Once that's been done, Sheogorath is pleased. Sheogorath: "Splendid, splendid! But wait? Do I hear someone approaching?" Jorunn the Skald-King: "Why do you fight, you milk-drinking dogs?" Sheogorath: "Oh, it's simple my king. The Mages Guild caused this in-fighting. It's all their fault!" Jorunn the Skald-King: "The Mages Guild? This mewling puppy? You want trouble? Here is trouble! For the Pact!" Once the Pact leaders have been defeated, it's off to the home of the Aldmeri Dominion: Skyroot Heart. Sheogorath will implore you to hurry there: "Step on, step on! The show must go on!" Once again, Sheogorath awaits you at the gates. "We now pause for a brief intermission. Would you like some cheese?" "No time for witty banter, eh? Fine, fine. This act features the Aldmeri Dominion. Cats and Elves! I never had a taste for either, honestly. Too much fur and fancy." And my role is to kill more of your actors? "Let's play it by ear. The scene: Queen Ayrenn is addressing some of your peers. As a master thespian, you should respond to her heartfelt pronouncements as you see fit. And... action!" Queen Ayrenn: "Either you're with the Dominion or you're against us. You want to be removed from this world? Fine. I'll do it for you." Queen Ayrenn: "Ah. Good catch, jester. Soldiers! Give this Mage the gift of exile." Queen Ayrenn: "Such impertinence! Razum-dar, Captain Odreth! Take care of this serf." Queen Ayrenn: "You killed my favorite cat! Such a loyal pet." Queen Ayrenn: "Looks like I'll have to handle this myself. You face Ayrenn Arana Aldmeri! In her full glory!" Sheogorath will be pleased when she's killed, simply saying "And... scene! Let's move on." You meet a downcast Sheogorath outside the gates of the Daggerfall Covenant city. "The third act always brings me down." "Because it means the play is almost over. I'm enjoying this so much I don't want it to end! And the sideshows! Have you enjoyed my little illusory [sic] performances? Very... illuminating, I think." I suppose. What do I do in this last act? "I won't tell ya, I'll show ya! That's the essence of storytelling. Show, don't tell. What do you think this is, community theater?" "Well, it isn't. This is a professional production! And you are the star. I'll set the scene. We can just improvise from there. Remember: show, don't tell." "Stage left, we have the founder of the Mages Guild, Vanus!" "Stage right, we have your old, old, old, old, old friend, Archmage Shalidor!" "And backstage we have Valaste, your new friend and confidant in the Mages Guild!" "But what's this? Why, it's King Emeric and his friends from the Daggerfall Covenant! No doubt he's got kind words to share. Take it away, Your Highness!" King Emeric: "For perpetuating the use of magic, we hereby burn you at the stake. Let your corruption be gone from this land once and for all!" "Bravo! Author, author! Oh wait, that's me..."
I did as you asked. Can I have the tome now? "Hmmph. I don't know. Your performance was a bit uninspired at points. And you refused to eat cheese with me!" "Yes, yes. You did make me laugh. And cry. And kick Maleel in the head. I suppose that's all I could ask. Take your book. Just don't eat it all at once!" "The book will take you back, it knows the way. Just remember, little actor. You still have one book left. And if you thought my play was rough, just think of what's ahead. Hah!" During The Grip of Madness Sheogorath possesses the mage, Daraneth of Southpoint. Therefore it could be said that her actions and dialogue from the time you meet her until Sheogorath reveals himself in the cathedral are those of the Mad God. This page was last modified on 7 January 2019, at 20:30.